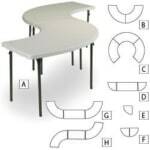 The Correll FS3096S serpentine folding table’s shape is excellent for serving lines and schools. Its blow-molded plastic top is durable, resisting damage from water and impacts. Since the material is gray granite, it blends into many different design schemes. Even though the table is 96 inches long, it can be carried because it folds in half, the legs fold up, and it has a built-in carrying handle. 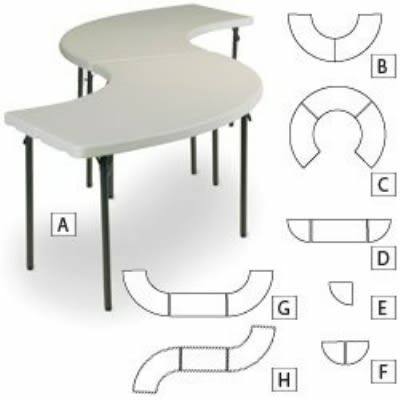 FS-Series Blow-Molded Food Service Folding Table for Banquet and Food Service Use features plastic, waterproof tops. These tables are light weight for easy handling and stain and impact resistant. Steel frame with locking folding legs. 30" x 96" Serpentine. Gray Granite Plastic with Charcoal Frame. Comes with 5-Year Limited Warranty against defects in material and workmanship. I would love to have this table but the freight cost is mor.